The best compliment to sriracha is another element that features a fatty, creamy and slightly mild note—like raw cashews—as it slightly tempers the heat, yet allows the other chili and vinegar notes to become more pronounced. 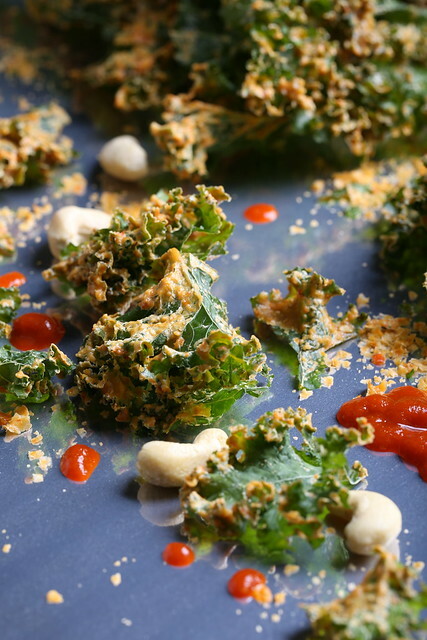 I’ve used this principle here to create a balanced coating for kale chips by grinding down some raw cashews and combining them with a roasted red pepper, nutritional yeast and raw tahini before adding a bit of sriracha in at the end. 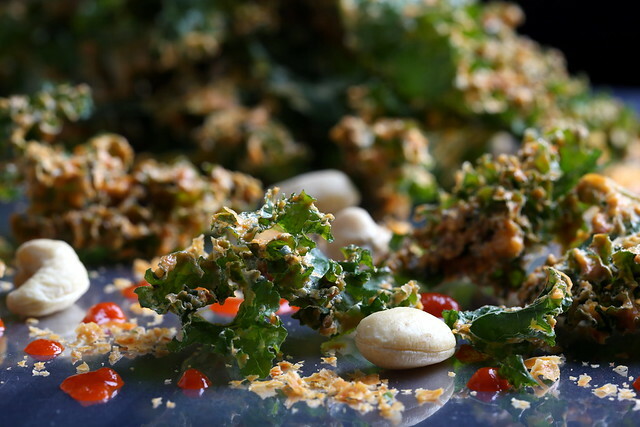 Once fully dehydrated, the chili and cashew coating creates a kale chip that is pleasantly spicy, bright and addictive. Separate the kale leaves from the ribs and rip them into bite-sized pieces. Discard the stems or save them for making stock later. Place the cashews into a small food processor and grind until they form a fine powder. Add in the roasted red pepper and salt and grind again until a paste is formed. Add in the tahini, nutritional yeast and water, then process until a smooth texture is achieved. Add in the sriracha, taste, then adjust any seasons as needed. Place half of the kale into a large prep bowl. Drizzle half of the mixture over the top and mix vigorously with a large wooden spoon until all of the kale is evenly coated. Place onto a food dehydrator tray. Repeat with the other half. Dehydrate the kale for 12-14 hours at 115 degrees. Transfer and store in an airtight container or serve immediately. This looks like the tastiest snack ever! But I don't have a dehydrator – any chance it might work in the oven? Thanks! Most ovens only go down to 170 degrees, so I've read that you can dehydrate this way by leaving the oven open a crack. But that seems like a long time, as dehydrating can take up to 12 hours! I've never tried it. If foods are dehydrated above 130 degrees, the heat begins to destroy most of the nutrients, so I like to keep the heat at 115. I bought my dehydrator for 70 bucks and use it exclusively for making kale chips, and it's totally worth it for that — the brand/type I use is linked in the post above — good luck! spread the kale chips over the sheets, as evenly and flatly as possible, to ensure even cooking time. Bake between 1 1⁄2 and 2 hours (time varies according to the dryness of the kale), tossing halfway through the baking, until the kale has dried out and is crispy but not burnt. Keep a close eye on the kale at the end of its cooking process, and remove any premature crispy chips from the batch if needed. Enjoy immediately or keep in an airtight container for up to 2 weeks. I haven't been able to get into kale chips, but with these being spicy and "cheesy" it would be worth another try!